After 13 years of dismay, relegation, administration and anguish, Bradford City finally tasted success! Six seasons in the bottom division have been painful to take at best, twice finishing 18th in League Two and barely clinging onto Football League status. However, Saturday 18th May 2013 changed all that. 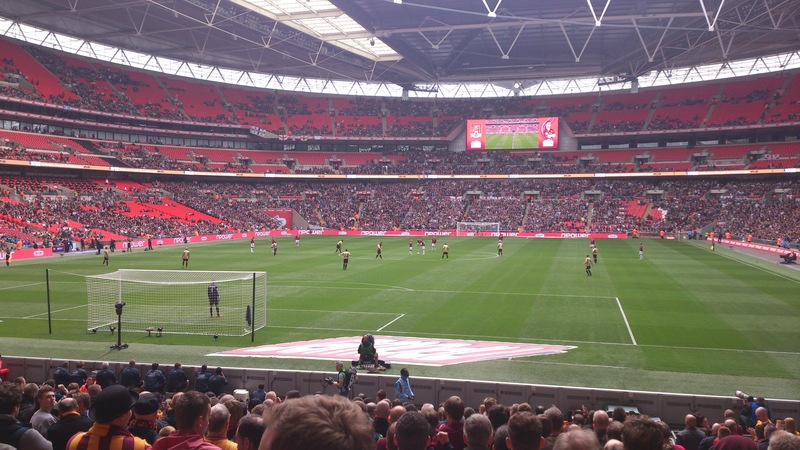 City made the trip to Wembley for the League Two play-off final against Northampton Town. It was Bradford’s second visit to The Home of Football this season and despite the heavy loss to Swansea, there was hope that the Bradford players would use that experience in their favour and emerge victorious. The League Cup adventure thrust The Bantams back into the media spotlight after a long absence but the effects of such a high profile cup run took its toll on the teams’ league performances. Many fans believed the possibility of finishing in the play-off positions to be a dream which had long since evaporated after the February final. However, boss Phil Parkinson reinvigorated the team and their motivation was reflected in the fifteen games which followed the Cup Final. City lost only two matches to secure 7th place in the table and the final play-off spot with a game to spare. An already intense season took a massive physical and mental toll on the players as the team played a total of 61 games before the play-offs, and now there was another two games to play against Burton Albion. The semi final started poorly with a tired display against The Albion at Valley Parade. A poor performance saw City go down 2-3 to a clinical and hard working side. Nerves seemed to get the better of Bradford and some slack defending allowed Albion danger man Calvin Zola to grab a brace. Guilt edged chances were spurned by both of this season’s star forwards and it was left to a penalty tucked away by Nahki Wells and a Garry Thompson wonder strike to rescue some hope for The Bantams. The second leg was a completely different affair. The partnership of Nahki Wells and James Hanson was successfully reignited as Wells scored twice and provided the assist for the big mans goal and City’s second of three. The contrast between the first and second leg epitomised City’s performances this season; the football showcased in the second leg was something that City have aspired to and showed just how well The Bantams can play with their strongest eleven on the pitch. The 1-3 victory put City through to the play-off final with a 4-5 aggregate win and it was destination dream land for Bradford once again as the second trip to Wembley beckoned. There was a sense of apprehension and anxiety amongst City fans before the final and sitting in the bars around Wembley I heard several incarnations of the same conversation. The League Cup final was a luxury game which everyone had expected Bradford to lose, but the play-off final really did mean everything to the club, the players and the fans. This was a football match not just an occasion. If City failed to beat Northampton then what would the future hold for the club? Star players like Andrew Davies, Nathan Doyle and Nahki Wells would be poached by teams from higher divisions along with manager, Phil Parkinson. That would result in another painful season in the bottom division with yet another squad of new faces, built by a new manager. 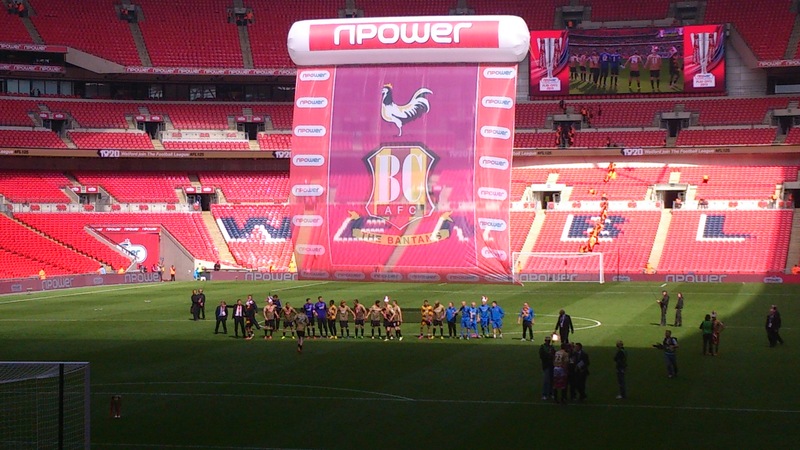 It was the pinnacle of Bradford’s season and the team produced the performance to match. The experience of the League Cup final worked in City’s favour as they settled into the game immediately, looking calm and composed in possession. City’s superiority on the ball allowed them to dictate the game, forcing Northampton to chase shadows in what was a ruthless first half. The tie was effectively over in the space of 15 minutes, a Garry Thompson cross found James Hanson at the back post and a commanding header from the big striker looped over Lee Nicholls in the Town goal after 15 minutes. City then doubled their lead within 4 minutes as Rory McCardle connected with Nathan Doyle’s near post cross to power his header home in Villa-esque fashion. The tie was then completed by leading goal scorer Nahki Wells who ghosted in past a static Northampton defence to finish off another cross from Garry Thompson before the 30 minute mark. Northampton, led by Bradford born Aidy Boothroyd and captained by football wordsmith Clarke Carlisle put in a disparate performance. They never looked settled in possession and posed very little threat to the Bradford defence, Roy O’Donovan and Chris Hackett rarely saw the ball in the wide positions and when they did Darby and Meredith kept things under wraps. Clive Platt cut a lonely figure up front for The Cobblers; kept in check by Davies and McCardle he had very little opportunities to trouble McLaughlin in the City goal. Even the cogent PFA Chairman and Town captain Carlisle could not lead his awestruck Northampton side back into the game. Carlisle and his centre back partner Nathan Cameron did not deal with Wells and Hanson as the City duo caused chaos amongst the opposition defence. Northampton resorted more and more to ‘route one’ tactics in the second half with the introduction of man-mountain Ade Akinfenwa, but the big forward was marshalled superbly by Davies and McCardle. His only noteworthy contribution was a header that bounced harmlessly wide. Bradford remained strong and managed to shut out the opposition for the full 90 minutes. Emotions ran high in the 56th minute. The whole Bradford support stood for a round of applause in memory of the 56 fans who died at the Valley Parade stadium fire in 1985. Already three goals to the good, it was a fitting tribute to those that sadly lost their lives and one that will be remembered for years to come. With the final whistle came the culmination of a fantastic season, capped with victory in the play-off final and promotion to League One after six long years in the basement division. Parkinson has built a squad that will go down in the clubs history as one of the best; a team of heroes who won promotion and wrote their own chapter in football history beating Wigan, Aston Villa and Arsenal to make an appearance in a major cup final. The 2012/13 season has been the best Bradford has seen in many years with a number of highlights, playing the type of football which the fans haven’t seen for a long time. The class of Nathan Doyle and the tenacity of Gary Jones in central midfield; the clinical finishing of Nahki Wells, the aerial power and work rate of James Hanson and the defensive mastermind that is Andrew Davies. The entire team completely outclassed Northampton from start to finish on Saturday to cap what has been a brilliant campaign and one that can hopefully catalyse the clubs revival. 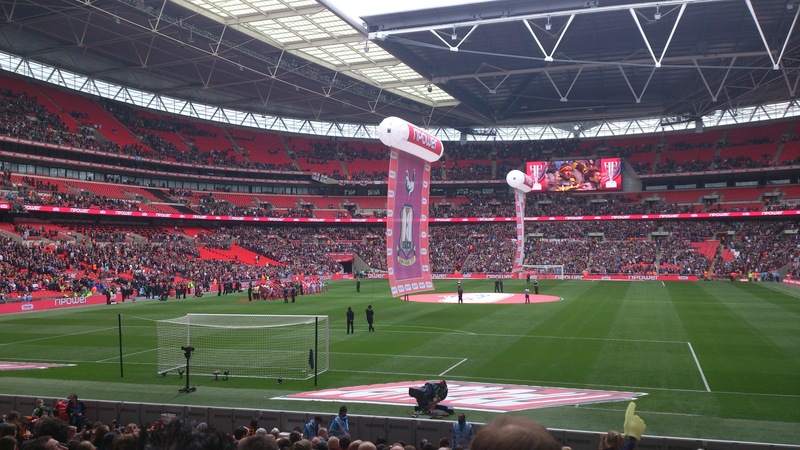 The main feature of City’s game in the play-off final was the threat from the wide areas. Left winger Kyel Reid looked particular dangerous and the overlapping Australian left back, James Meredith was equally impressive after a brilliant first season with The Bantams. On the opposite flank, Garry Thompson hit form at the back end of this season and his two assists on Saturday were by far his most important contributions. Stephen Darby has also proved to be one of the best right backs in the league. His consistency has been the feature of his season and his importance to the team was justified as he picked up the ‘Players player of the year’ trophy at Bradford’s end of season awards. It’s been a long and arduous campaign for City and the play-offs brought the total of games played this season up to 64. After a 13 year fall from grace, two administrations and three relegations, it finally feels like City have turned the corner, rising from the ashes of adversity to open a new chapter in the clubs history. ← The Football Business, Club Ownership and the Measurements of Success?